Long before Rebecca, and long before Menabilly (Manderley in Daphne du Maurier’s best loved novel) there was Ferryside. 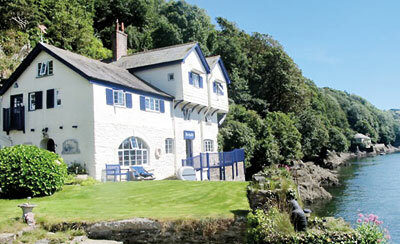 The large 1860s cream and blue building cradled into the water’s edge is a former boathouse which was discovered by her, with her mother and two sisters, while motoring down to the south coast of Cornwall in September 1926. She was only 19 years old. As she remembered “The hired car swept round the curve of the hill and suddenly the full expanse of Fowey harbour was spread beneath us. The contrast between this sheet of wide water, the nearby jetties, the moored ships, the grey roofs of Fowey across the way, the clustering cottages of Polruan on the opposite hill by the harbour mouth, and narrow claustrophobic Looe where we had spent the night on our way down from London was astonishing, like the gateway to another world.” It is still the same today. 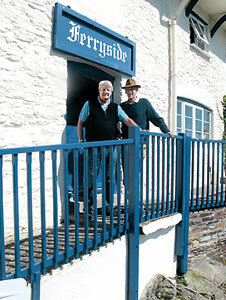 Ferryside is right on the water at the foot of the hill in Bodinnick. In 1926 the car deposited the budding novelist’s mother and daughters at the foot of the hill by the ferry and they either had to cross the ferry into Fowey (pronounced Foy) or else lunch at the Old Ferry Inn which is still there today opposite Ferryside. Climbing the hill to the Inn the girls noticed a “For Sale” sign on a gate just above the ferry. Behind it was a strange looking house built like a Swiss chalet. The ferryman standing nearby confirmed that it was called Swiss Cottage and that they used to build boats there, and use the second floor for lofts. After lunch the du Maurier girls, led by Daphne, went into the boat yard and found yet another gate that led to the other side of the house and discovered the remains of a garden. The chalet part of the house was built against the rock, with the windows facing out across the harbour. Nothing has changed. The house is still owned by Kits Browning, Daphne du Maurier’s son, and I visited him on a glorious day this summer. Looking out from the house I could imagine the young du Maurier seeing the blue water immediately below as I looked towards the harbour mouth. Boats were everywhere and larger yachts at anchor. “There was a smell in the air of tar and rope and rusted chain, a smell of tidal water,” du Maurier remembered. Here then was the isolation that the young du Maurier craved – away from the crowded city life with all its duties and restrictions. Here was the freedom to write, to explore, to climb the hill walks, to boat, and to be alone. Swiss Cottage was bought and re-named Ferryside. All through that winter and the next spring decorators and builders transformed the old boat house and in May that year she came back to Ferryside and was left alone for the first time in her life. It was here in the middle floor bedroom overlooking the harbour that she wrote her first novel The Loving Spirit published in 1931. It is a room for dreamers and the bewitched du Maurier wrote three other novels before the publication in 1938 of Rebecca that made her one of the most popular authors of her day. Menabilly is only a few miles away across the estuary on the Gribbin peninsula. Ferryside today is exactly what you would expect it to be – full of character, jammed with family memorabilia: the Harrington Mann portrait of a youthful Daphne du Maurier, a smaller version of the Frederick Whiting portrait of the young du Maurier sisters (now in the House of Lords), portraits of both Kits’ father, Major Tommy “Boy” Browning, and his grandfather the actor-manager Gerald du Maurier. 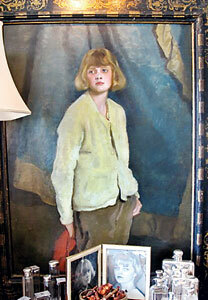 Silver-framed family photographs are all dotted around the ground-floor drawing room. As one enters Ferryside from the front door one looks down the length of the dining room to two comfortable pale green and cream sofas around an old brick log-burning fireplace. At the end of the drawing room is an enormous mirror which cleverly gives the impression that the room continues on for several feet. In the north-west corner is the giant figurehead of the abandoned schooner Jane Slade which inspired The Loving Spirit. It is not a huge house but the location is superbly romantic. The side hatch door opens right on to the Fowey estuary and is separated from the water only by a parapet and narrow strip of lawn. The three light airy bedrooms on the middle floor are reached by a stairway that climbs up the inside of the white painted rock face against which Ferryside is built. “I for this, and this for me”, du Maurier said. It was at Ferryside that she met and fell in love with the 35- year-old Major Tommy “Boy” Browning of the Grenadier Guards, who was so enamoured with The Loving Spirit that he cruised into Fowey in his 20 foot boat Ygdrasil in 1931 determined to meet the young author. They were married in July the following year in the 14th century Lanteglos Church some way up the Polruan hill behind Ferryside. Curiously the kitchen at Ferryside is conveniently on the top floor of the house next to the master bedroom. It spills out on to a deck with a staggeringly beautiful view southwards down the Fowey estuary and the open sea. Only a solitary palm tree silhouetted against the skyline disturbs an otherwise tranquil horizon. Not surprisingly for a house as old as Ferryside the ceilings are quite low – but not threatening except for the entrance doors. At night the lights of Polruan and Fowey give glimpses of a different world. Anchored ships reach up through the darkness. Ghost trees frame the legendary scene and one hears or imagines suspicious voices echoing over the sweeping bay. This is where smugglers used to ply their trade. The six mile Hall Walk from Ferryside is a simple stroll through the lower reaches of Port Pil and on to Polruan. Follow it and it will return you safely back to Bodinnick. As Kits Browning explained, his mother never actually owned Ferryside but lived here on and off from the home she shared in Kent with her husband and eventually three children. Then in 1943, on a whim, she rented the mysterious and dilapidated Menabilly from the Rashleigh family. It was in a fearful state but she somehow restored it and lived there for the next 26 years. However, it was in Ferryside that she discovered herself and the magical world of make-believe and it was from here, while walking that she discovered the derelict schooner Jane Slade, and it was in Ferryside that she began writing The Loving Spirit one “wild day in October with a howling sou’westerly wind and slashing rain, a rug wrapped around my knees, sitting at the desk in my bedroom at Ferryside. Its title came from a poem by Emily Bronte. The inspiration to write a novel comes from within. The Loving Spirit was inspired by the sense of freedom that my new existence at Ferryside brought.” It is that sense of freedom that still exists today at Ferryside.